Sea turtle nesting season is underway in the Coastal Bend, which means public hatchling releases at Padre Island National Seashore will begin soon. Each summer, thousands of turtle enthusiasts gather at sunrise along the seashore to watch as the most endangered turtle species in the world — the Kemp's ridley or Atlantic ridley sea turtles — begin their life journeys. A natural wonder, the releases are also a economic boon to the region, drawing visitors to the area from all over the country. In 2017, the National Seashore hosted 27 public releases with more than 17,000 tourists and locals making the early morning trip to watch the turtle trek. Nesting season for sea turtles is typically from early spring until late July or August, though it had a late start this year. From December to February, the gulf coast experienced three freezes. This lead to water temperatures dipping below 50 degrees, cold-stunning a record number of sea turtles. That’s when the Division of Sea Turtle Science and Discovery becomes a rehab center for injured turtles. In the summer, however, Shaver and her helpers become surrogate parents, as mother sea turtles are notoriously bad care givers. Once they lay their eggs in the sand, they head back to the ocean until the next nesting season draws them back to shore. Shaver asks that anyone spotting a sea turtle nesting notify PINS immediately by calling (361) 949-8173. They should also mark the spot, but only after the mother is long gone. If a mother turtle is disturbed, she will return to the water without laying her eggs. Park rangers will soon arrive and carefully transport the turtle eggs to incubators at PINS. Within the next 40 to 48 days, the eggs hatch and the babies prepare for their own trip to the Gulf. Hatches are carefully watched, as the young turtles must be released when their begin what Shaver calls a frenzy. If they are not released at that time, they get too tired to survive the walk and swim that must take them out to sea. The further out they get, the more likely they are to survive. Once in the water, the hatchlings spend the next three years playing in the currents, traveling up the gulf stream along the Atlantic coast — if they are lucky enough to avoid predators. Rangers and volunteers scare off sea gulls while the turtles are on the sand, but once in the water they are on their own. When they reach adulthood, they migrate back south to the gulf coast — often stopping in the Coastal Bend, which is on the migration route to their native home in Mexico, in the coastal towns of Rancho Nuevo and Tamaulipas. In fact, PINS is the most important Kemp’s Ridley nesting beach in the United States. The National Seashore has made sea turtle conservation a central focus of its purpose and programs since the highly endangered species reached its lowest point in 1985 with only 702 turtles worldwide. Due to the efforts of Shaver, her staff, and enthusiastic volunteers, the numbers have increased dramatically in the Coastal Bend. 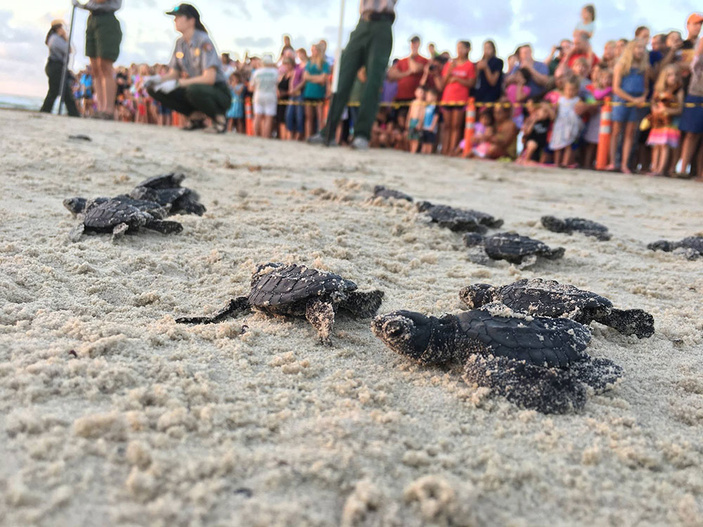 In 2017, nearly 27,000 hatchlings were released. In February, Shaver was granted a Lifetime Achievement Award from the International Sea Turtle Society for her tireless recovery efforts. Take a look at the 2018 Sea Turtle Nesting Season at nps.gov/pais. Follow the Division of Sea Turtle Science & Recovery on Facebook, which stays up-to-date. Call the Hatchling Hotline at (361) 949-7163 to find out the latest information, including new releases or release cancellations. Turtle releases have been growing in popularity as the species begins to make a comeback.